I loved, loved, LOVED this book! Recommended to me by a sixth grade literature teacher, I gobbled it up in a two sittings. A few days later, I learned it won this year’s Newbery. Well-earned, I say! Following an illness, twelve-year-old Abilene’s father, Gideon, sends her away to friends in Manifest, Kansas, a town that strongly influenced his childhood, though he never talked about it much. It’s hot and dry, the dustbowl era, right smack in the middle of the Depression, and Abilene holds out desperate hope that her father will come back for her. But the rails, he told her, are no place for a young lady. While she’s there, Abilene uncovers stories from 1917 that lead her on a spy hunt with two friends. The stories tie her to the town and develop a love within her for its people. But love, she learns, can be devastating. 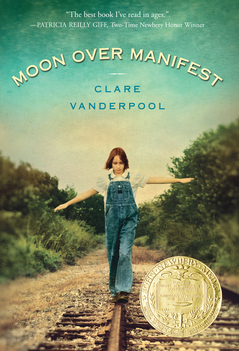 Moon Over Manifest is Ms. Vanderpool’s first novel, but it is so tight. Every colorful detail eventually finds a place in the book’s final picture. Every single character becomes important. Everything fits together. And the human emotion it paints for us is still relevant eighty years after the book takes place. The story does contain a spiritual element in the form of a gypsy story-teller who also poses as a medium. Abilene is skeptical of her the whole time, and nothing weird actually happens. The woman’s past later becomes intricately woven in the plot. Great choice for readers 10 and up, especially those who enjoy nostalgic, small-town flavor. I almost think adults would like this one better than kids. It’s a powerful little story. A definite must-read.